Since it is starting to get dark earlier and earlier each day, I have been making time in the mornings to hang out with the chickens. When there's plenty of daylight left in the evenings I usually spend more time with them after work, but around this time of year my chicken time shifts to the mornings. First up, I make sure there's plenty of food in their feeder and they all get started with a big breakfast. This gives me a chance to check out their lovely, fluffy bottoms! Duchess and Sylvester patiently await their exit from the coop after the breakfast rush. It's fun to watch them peck and scratch around the run to see if they can find any bugs to munch on. Clearly breakfast is never enough! Of course Cam has to crow his head off to make sure everyone knows he is there. If I'm lucky, some of them will come over to say hi and hop up on my boots. After a while, Sylvester gets bored with the chickens and heads off for another adventure. I love mornings with the chickens. It's a really great way to start the day! I always enjoy your Friday updates. Thanks for sharing today! Ha! That would be funny. Thanks for linking up! I LOVE those photos. The rooster on your boot is hilarious! great shots!! Have a nice weekend! Thank you! I love the dog in your profile pic! 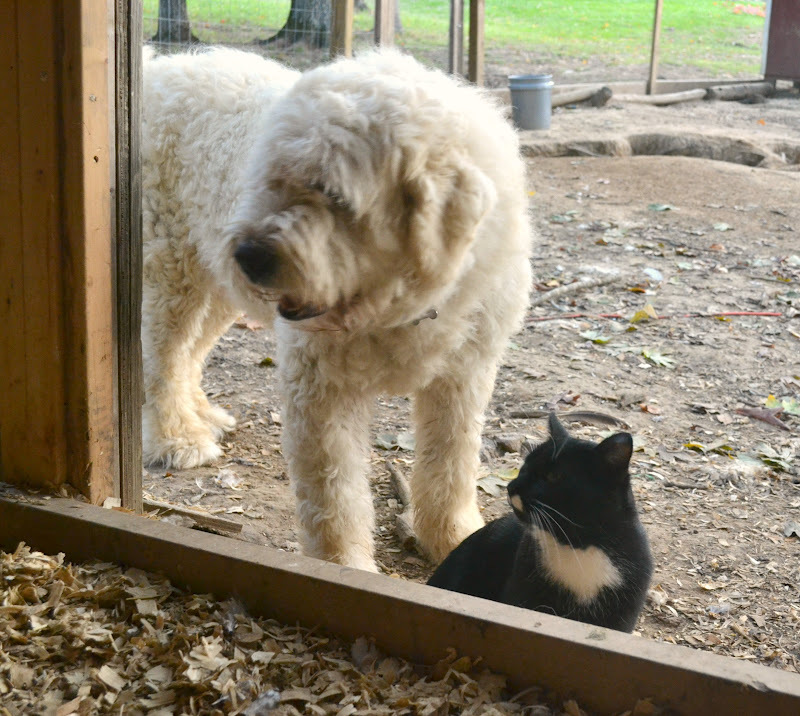 What a sweet farm life with all the animals! I'm hearing it's a really hard work :) Enjoy your Sunday! It's not work for me because I truly enjoy it! Hope you have a wonderful weekend and thanks for stopping by! I love your beautiful chickens (such gorgeous feathers). How cute! Love those crowing shots! Your chickens are beautiful. Loved seeing your rooster crow. The kitty looks a lot like my Zoe, except that the white spot on her face is on her chin. Beautiful pets. I love your photos. It does sound like a lovely way to start the day. Thanks for sharing. He's a handsome barred rock. The ladies love him! It looks so pretty where you live. Love the trees. Your rooster hanging on your boots. Aren't chickens the best company? I love hanging with my girls. Thank you, Elaine! We really love it out here. Chickens make great company. They are always so fun to watch! Great shots! Your rooster is marvellous! I'd love to have chickens. Thanks, Karen! Chickens are so much fun; I highly recommend them! I love how everyone one accompanies you to the chicks! Gorgeous photos. The clarity is amazing! Thanks, Rosemary! I recently got a new camera and I've been having so much fun taking pictures. love the dog and cat photo! 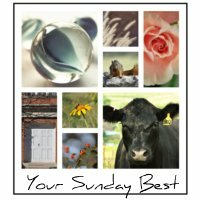 Thanks for sharing at Your Sunday Best. Sure, it was my pleasure! Thanks! I love your hens and Sylvester is gorgeous. He looks a little like my rooster Queenie. He got his name when he was a baby. He was supposed to be a hen. 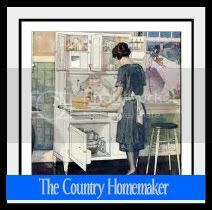 I am so glad you shared your Feathered Friend Friday on The Country Homemaker Hop. I will be following along from now on. Have a great weekend. Hi Heidi! We have another rooster who was supposed to be a hen as well. I guess it's more common than I thought!